What does Google's mobile algorithm update mean for PPC? It’s certainly clear that Google has strong intentions to move users towards a mobile friendly web, seeking to make the best possible experience for their users. After all, search queries on mobile have now surpassed desktop searches, so these updates come as no surprise. On April 21st Google rolled out the mobile friendly update. Prior to this, mobile rankings for a website were usually tied to the ranking strength of the desktop site. Ranking well on desktop SERPs usually meant that you would also rank well on mobile SERPs. Since the update in April agencies have seen a boost in rankings, especially where competition has not adapted to a mobile-friendly site. Certain companies have seen as much as an 88% drop in mobile traffic due to their sites not being mobile friendly, which clearly shows you how severe the impact can be. We take a look at some of the main impacts Google’s mobile algorithm update has had to paid search campaigns and provide some helpful tips to ensure you don’t get left behind and lose valuable customers. How has the update impacted paid search CPCs? When Panda and Penguin first launched, many companies’ organic rankings were negatively affected which obviously made a big impact on revenue figures. To make up for this loss, companies had to invest more of their marketing budgets into PPC to fill the void. The mobile friendly update has been no different, with mobile CPCs increasing in certain accounts where their competition has had no mobile-friendly site. This trend is probably set to continue until companies have adapted their sites, recovering both rankings and traffic. What does this mean for your mobile paid search strategy? A good place to start is making sure you’re speaking to your mobile audience and desktop audience differently. This can be done by implementing mobile-preferred ads, which can only be seen by users searching from their mobile phone. It’s best practice to keep your communications short and sweet and make sure that the desired action is possible on mobile ie: don’t ask them to download whitepapers… instead, direct them to call, email or visit a nearby store. As with all digital marketing techniques, mobile bid adjustments aren’t something you should ‘set and forget’. Mobile CPCs have increased 150% since 2012 and as we know, show absolutely no signs of slowing down. Make sure you constantly monitor the number of impressions, clicks, conversions and CPA on mobile as opposed to desktop, and make appropriate bid adjustments based on performance. If you notice that click volume is high, but your conversions are lacking, then it might very well be down to your poorly optimised mobile landing page experience. Ad extensions are a terrific way to increase your ad’s CTR. They also play an important role in your quality scores. Location extensions are particularly important if your business is based both online and offline. People are constantly on their mobile phones looking for directions, so make it as easy as possible for them to find you and avoid losing out on any offline sales! 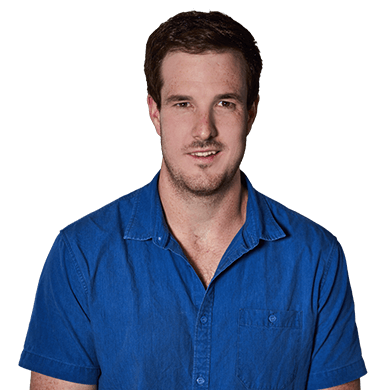 If you currently don’t have a mobile site and you’re struggling with getting mobile traffic to convert, then you might want to think about utilising call only ads. These only give users the option to call and not get directed to your website. 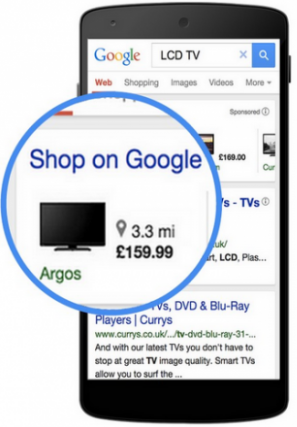 If you’re an eCommerce business, Google Shopping is an absolute must! These high intent searches normally see higher CTRs and conversion rates due to their visual impact. Since mobile real estate is also a lot smaller, Google Shopping provides opportunity to take up more of the space and override your competitors. Will paid search be seeing a similar mobile update? I don’t think a similar update for paid search would come as a surprise to anyone. As we know, Google want to provide the best user experience possible. A mobile friendly PPC update would force many companies to adopt mobile friendly sites if it meant their quality scores and overall performance would be affected. Those advertisers who rely on paid search, and not organic search, are not as concerned about the mobile responsiveness of their website due to the mobile-friendly feature being part of Adwords quality score since September 2011. Over the past two months, Google has started testing a “mobile-friendly tag” onto the front of Adwords ad description lines. 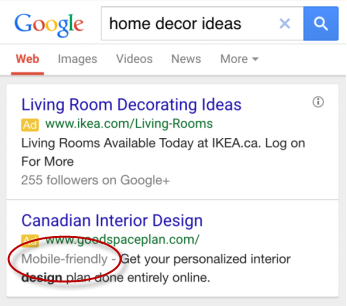 This could indicate that Google are looking to place more emphasis on the mobile friendliness for PPC landing pages. Looking back a few years, ad extensions were never part of the Ad Rank formula, this changed when, in 2013, Google announced these would contribute to quality score. So, don’t be surprised if more mobile factors start making up a bigger portion of quality scores in the months to come….watch this space! 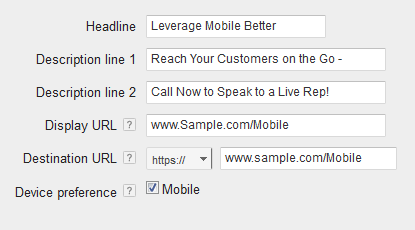 So, it appears that a PPC mobile update could be arriving sooner than we think. The combination of algorithm updates and mobile searches surpassing desktop means that you need to become mobile friendly immediately. It’s not only important to think about your site but to also think about the mobile strategies involved with driving traffic to it. If you’d like to get a quick overview to how mobile friendly your landing pages are, check out this handy Google tool mobile friendly tester.